Give your photos something extra by applying one of over a thousand high-quality photographic effects. Make more creative photos by selecting the best “look” for your image. Use this exploratory product to create photography effects and looks that you might otherwise never think of. There are plenty of tools that help you achieve a specific look in your photos. But Topaz ReStyle is different – it gets you results that you wouldn’t have thought of otherwise. So next time you’re staring at an image after making some minor adjustments and it’s just not quite there, try using ReStyle to jump-start your creativity. ReStyle’s proprietary technology learns from real photos to create sublime effects unavailable anywhere else. Immediately get hundreds of professional-quality results that would otherwise take you hours in Photoshop. 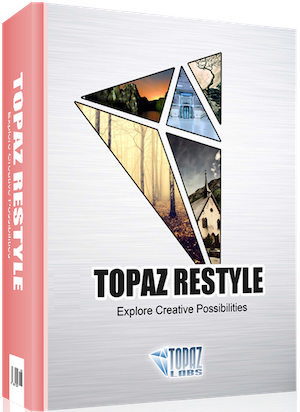 Get a creative and interesting result every single time you apply Topaz ReStyle to your image. ReStyle’s proprietary engine intelligently maps external tones + colors into your image, giving fantastic results. With this many photographic looks and styles at your fingertips, it’s impossible to not find the perfect one. Take full control over your results by fine-tuning each effect’s colors and using the built-in HSL adjustments. Try different blending modes and opacity values to find the perfect balance in your photo. Search not only by keyword but also by color. Open a full-sized gallery for quick browsing. Use the powerful included masking suite to easily apply effects to only certain parts of your image. Need more than a thousand effects? No problem, create as many of your own as you like. Plugs into Photoshop, Lightroom, Aperture, iPhoto, and much more. Use it wherever you currently edit photos. Every feature in ReStyle has a single purpose: to help you to find the perfect effect for each photo you process. Get it now to take advantage of the most powerful and comprehensive collection of effects ever offered.